I've had an ageing Apple TV 2 for quite some time now, it's been running the aTV Flash (Black) software to stream from my local file server, although that setup was mostly working fine, I was noticing a lack of features, so I've decided to replace the ATV2 with a Raspberry Pi 2 and Plex and to make it all run by drawing power from the TV itself. 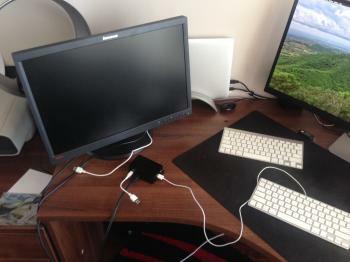 My raspi arrived about a week ago and I got busy getting it set up. I downloaded RasPlex and installed it. Installation was a breeze, all I had to do was select some options and then the installer created the SD card for me without any hassles. Once the raspi booted up, I did SSH into it and changed some settings to overclock it, apart from that everything else was as is. I tried to have the raspi connected to an old monitor using a HDMI-to-DP cable, that didn't work so I had to plug it into my Dell U3415W using a standard HDMI cable instead. Apart from a super stretched picture, this actually worked. After RasPlex was installed, I tried pairing my Apple Wireless Keyboard with the raspi, however, even though my bluetooth dongle was functioning and could see the keyboard, it would not recognise any keys being pressed. After reading up a bit on this online and seeing other people having the same issue I went out and bought myself a $28 2.4Ghz wireless keyboard instead. This keyboard is seen as a standard USB device so no bluetooth is involved. Problem solved! 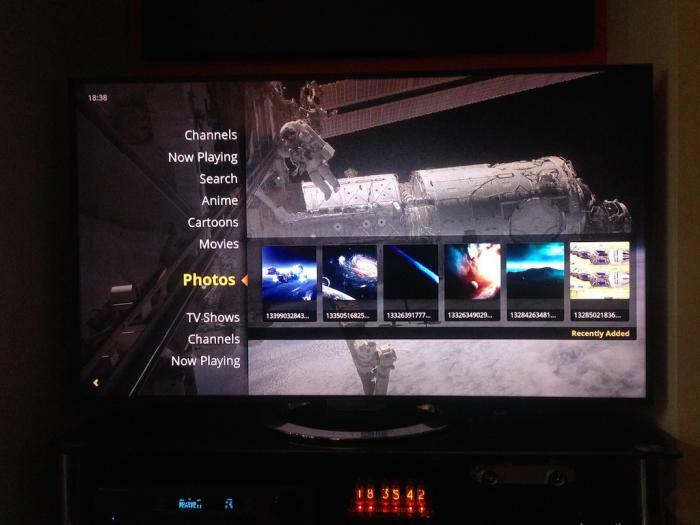 On my server, I've installed the Plex software. This was a little confusing at first, but I quickly figured it out. One change I've made to the software was to disable the transcoder. I was only going to stream to the raspi so there really was no need to have it enabled. mv "Plex New Transcoder" "Plex New Transcoder.disable"
mv "Plex Transcoder" "Plex Transcoder.disable"
Now with the raspi set up and ready to go, I had to have a way of powering it while it was connected to the TV. At first I was just going to connect one of my spare micro-USB power adapters to it, but then I had an idea - what if I powered it from the TV itself? My TV is a Sony Bravia KDL-55W900A, there are several USB ports on the back and sides, so I got a micro-USB cable and plugged it in. The Raspberry Pi powered up and booted and was showing the Plex interface, it was actually working! 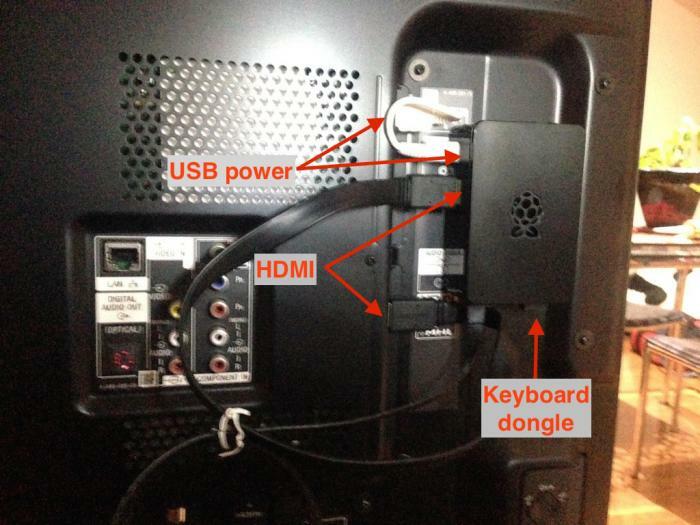 After this first try, I got a shorter USB cable and a short HDMI cable, and some double sided tape to attach the raspi to the back of the TV like in the photo below. I've got one of Belkin's smart power boards, the TV is set up to turn off when the HDMI receiver is switched off, this means that the raspi also loses power when the TV is off. Surprisingly I've had no file system corruption issues and am pretty happy with this kind of arrangement. 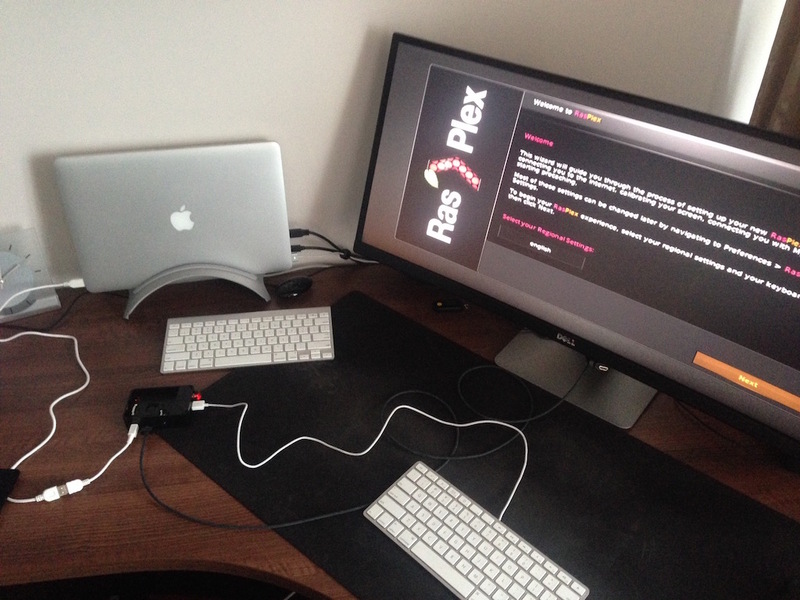 RasPlex boots up very quickly, usually only taking several seconds longer to boot than the TV itself. This is much faster than what Apple TV2 would take to boot. So there you have it, the raspi is powered by the TV and in turn sends it's picture to the TV, it's out of the way and completely controlled using a wireless keyboard, this trio works really well together and doesn't have messy wires all over the place.